Behind every financial crisis lurks a “political bubble” — policy biases that foster market behaviors leading to financial instability. Rather than tilting against risky behavior, political bubbles — arising from a potent combination of beliefs, institutions, and interests — aid, abet, and amplify risk. 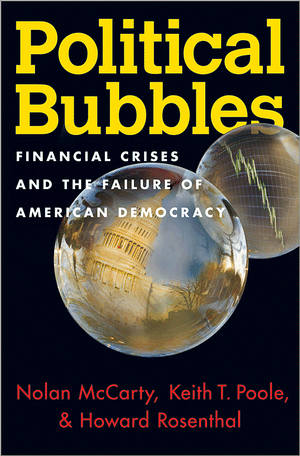 Demonstrating how political bubbles helped create the real estate-generated financial bubble and the 2008 financial crisis, this book argues that similar government oversights in the aftermath of the crisis undermined Washington’s response to the “popped” financial bubble, and shows how such patterns have occurred repeatedly throughout US history. The authors show that just as financial bubbles are an unfortunate mix of mistaken beliefs, market imperfections, and greed, political bubbles are the product of rigid ideologies, unresponsive and ineffective government institutions, and special interests. Financial market innovations — including adjustable-rate mortgages, mortgage-backed securities, and credit default swaps — become subject to legislated leniency and regulatory failure, increasing hazardous practices. The authors shed important light on the politics hat blinds regulators to the economic weaknesses that create the conditions for economic bubbles and recommend simple, focused rules that should help avoid such crises in the future. The first full accounting of how politics produces financial ruptures, Political Bubbles offers timely lessons that all sectors would do well to heed.